JFK was here | Where's my backpack? 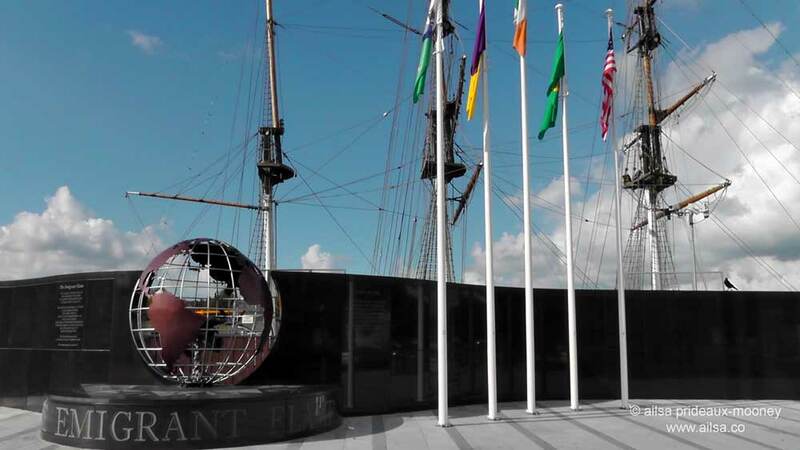 In October 1848 a young farmer from Dunganstown in County Wexford left Ireland for Liverpool and then sailed on to the New World, starting a chain of events that gave rise to the 35th president of the United States. The farmer’s name was Patrick Kennedy and his great grandson, well, you know the rest. He married his best friend’s cousin, Bridget and started a family but Patrick didn’t last too long in his adopted city of Boston. He died of cholera in 1858; in an eerie coincidence he died on November 22; his presidential great grandson would be assassinated on the same date 105 years later. Bridget kept the family going by working as a maid; then saved up enough to purchase a stationary and notions shop. When she expanded the business to sell groceries and liquor, she paved the way for the success of future generations of Kennedys. 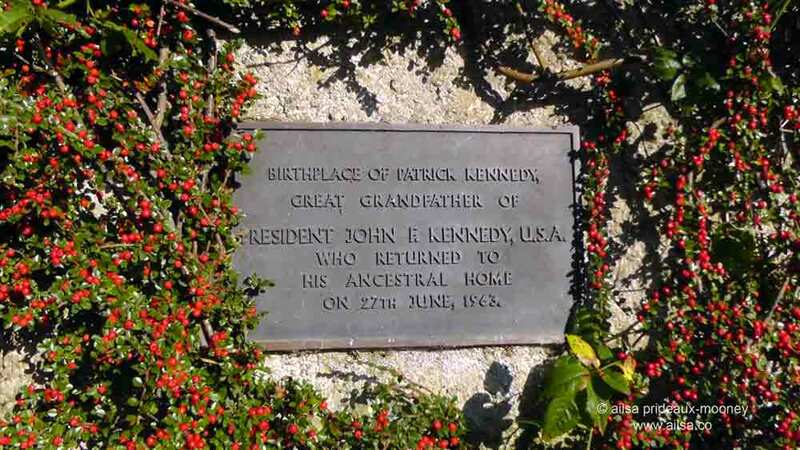 In 1963, shortly after announcing he was a doughnut “ich bin ein Berliner” to the citizens of Berlin, John F. Kennedy flew to Ireland and made a short visit to his great grandfather’s old stomping grounds. This wasn’t just a presidential visit; this was the Republic of Ireland’s first major media event. The Irish national television station RTE had only been up and running for about a year and a half and had to borrow equipment from the BBC so they could cover the event. People were beside themselves with excitement; crowds lined the streets just to catch a glimpse of the guy with the tan and impossibly white teeth. Portraits of JFK shared pride of place on Irish walls and mantelpieces next to the Pope and the Sacred Heart. He was a shining example of a successful emigrant story; proof that heading off into the great blue yonder sometimes turns out to be the best thing you can do. It is little wonder that the memory of that visit is still writ large upon the county of Wexford. The Emigrant Trail takes visitors on a 15 mile loop of three key heritage sites, starting with the market town of New Ross. 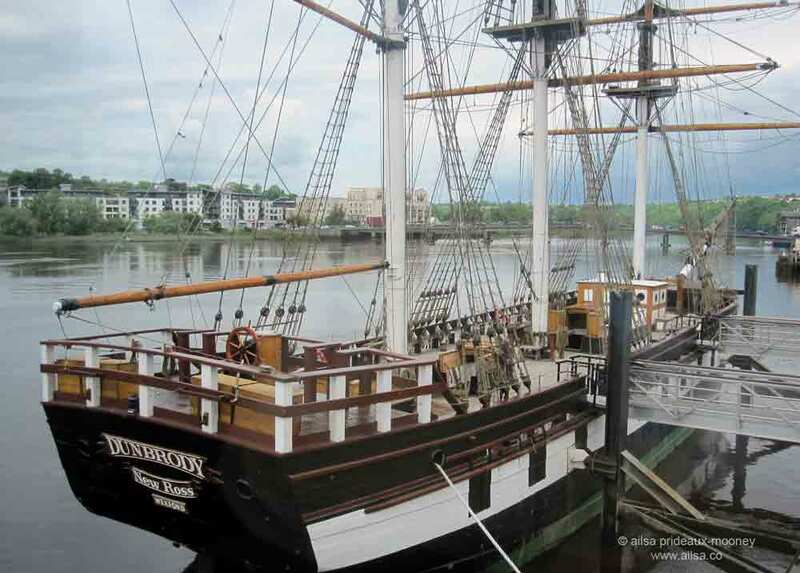 It was from this port that Patrick Kennedy left and today the quay is home to the Dunbrody Famine ship; a perfect replica of an 1840s emigrant vessel. By the entrance to the ship, there is a great bronze globe with an eternal flame burning within. 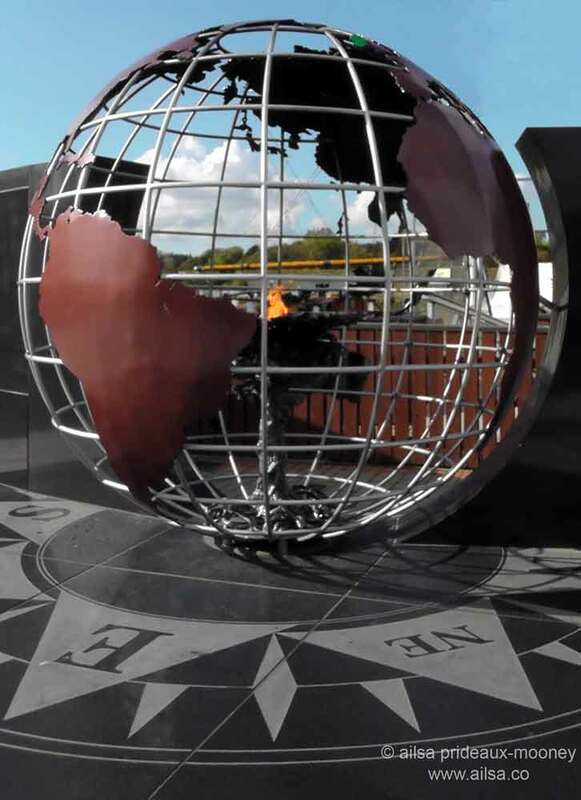 This is the Emigrant Flame; installed in 2013 to mark the 50th anniversary of JFK’s visit. The flame was lit, Olympic torch style, from the eternal flame on JFK’s grave in Arlington National Cemetery; then transported via Boston and Liverpool to New Ross, tracing Patrick Kennedy’s journey in reverse. 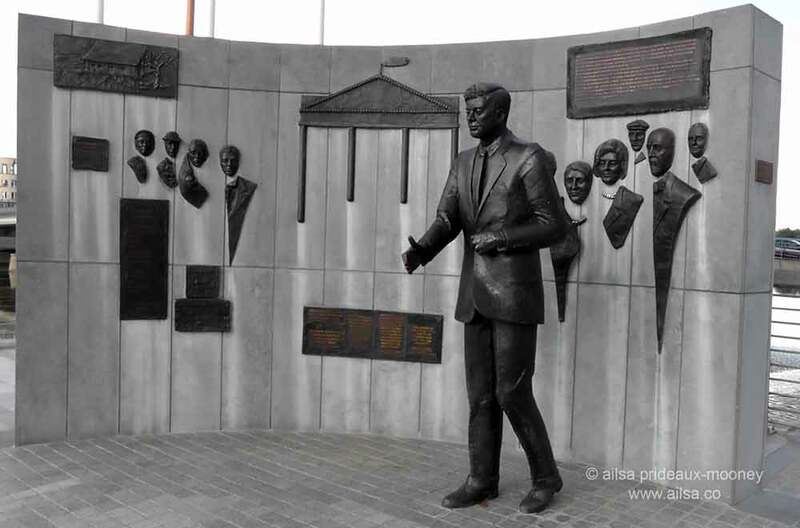 Further down the quay, there is a life sized statue of JFK himself, hand outstretched to anyone willing to shake a president’s hand. 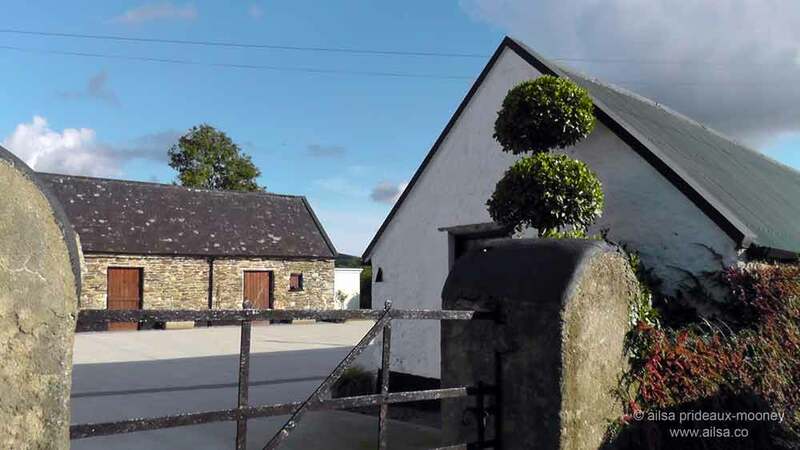 Four miles out of New Ross lies the Kennedy homestead. 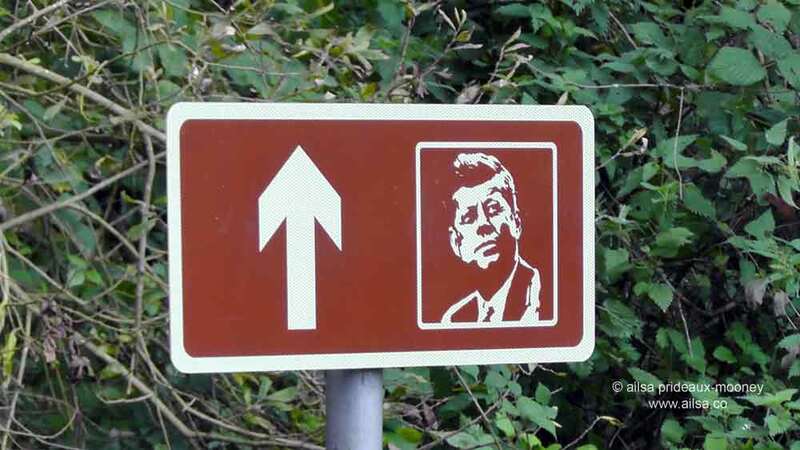 Even though it’s quite remote, down winding country lanes, you won’t get lost because there are great big signs bearing JFK’s face to ensure you stay on track. 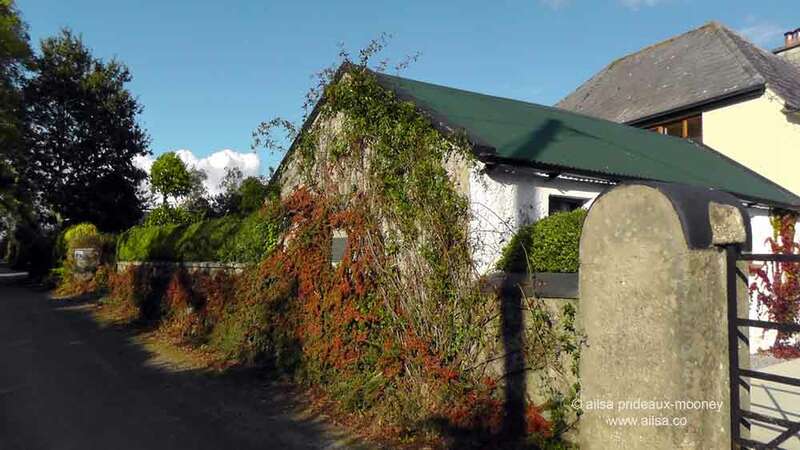 …although I doubt the authenticity of topiary in an 1840s Irish farmyard. Follow the trail a little further and you will find my favourite of the sites; the JFK Memorial Park and Arboretum. 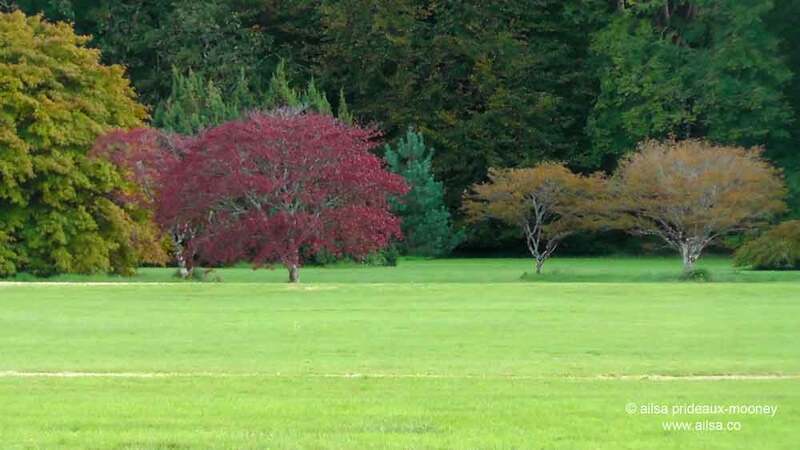 It was opened in 1968 in memory of JFK and is a stunning collection of trees and shrubs covering 623 acres. Five months after his visit to Ireland, JFK took that fateful car ride through the streets of Dallas; but during the four short days that he visited Ireland, he ignited the passion of a nation which burns brightly to this day. 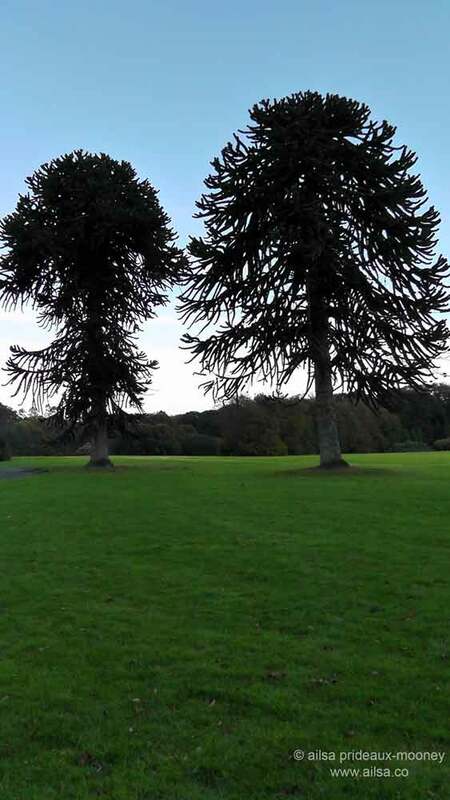 This entry was posted in Ireland, Photography, Travel and tagged history, ireland, photography, photos, travel, writing. Bookmark the permalink. I read somewhere recently that over 10% of the Australian population have an Irish ancestor, which is startlingly high. There were a lot of Irish political prisoners sent to Australia, but there were plenty of free men too, weren’t there, who went in search of work? And lots of women too – around the same time Patrick Kennedy left for the US, shiploads of Irish orphan girls were being sent to Australia to meet a growing demand for servants. So I guess there’s been substantial Irish influence dating back as far as the 1790s. Did your husband find out whereabouts in Ireland his family were from? The closest we have been able to get is County Clare. Mal’s GGGrandmother was one of the many young women brought here to be not only servants, but wives to ticket of leave men, convicts who had served their time but had no prospect of returning home. Wow, mail order brides even back then. Country Clare is gorgeous, I fell in love with Killaloe when I visited, and the Burren and the Cliffs of Moher always take my breath away. What an interesting post Ailsa. Our family has a close affinity to Ireland. My mother-in-law’s family arrived in New Zealand in the late-mid 1800s from Galway. They were not well off and struggled to make their way once they got here. But, now, if they could see the progress of their descendants they’d be amazed and proud. A significant proportion of immigrants to New Zealand in the 1800s were from Ireland. Here in my hometown, and it’s typical, they played a huge part in establishing a large parish, St Patrick’s 🙂 a convent and schools back in 1859. Thank you for this journey of President John F. Kennedy. I wasn’t aware of his trip to Ireland. What a fascinating story! How interesting to see a famous person from the perspective of another country. Thanks! I have a passion for ireland. I’ve never looked any of that information up. Thanks for the info and the photos. I will keep that in mind on my next trip there this summer! Lovely post. I remember what an event it was when he stopped to visit Ireland. Those ships were so small – it was a difficult journey. Thanks for the picture of the replica. The park is perfect. Such an interesting post. I think Maeve Binchey would include his visit in her books. I know she always wrote about the immigration of the the young to America. Great photos. What a great discovery! Thanks for sharing. Wow, this is great. I didn’t know any of this.